The Rotary Club of Port Blair as part of its International services in the presence of Director General of Police Shri. S.B. Deol, visited the Distress Camp at Brukshabad, run by the A & N Police in which 420 people from Bangladesh and Burma who had landed in the Islands under distress. The members of the Rotary Club of Port Blair distributed cloths amongst the inmates. 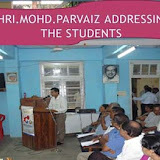 It was also decided by Rotary Club that since these people from Bangladesh and Burma had been confined in the Islands for a long time the Rotary club of Port Blair would take up the issues with Rotary club of Bangladesh and Burma requesting them to impress upon their respective Governments to take back these people as soon as possible so that they can be united with their families.